The Branford Land Trust’s mission is to preserve and protect open space in Branford, and to promote our community’s appreciation of Branford’s diverse natural features. Founded in 1967, we currently own and manage about 900 acres of woodlands, old fields and farmland, ponds, streams, inland wetlands and salt marshes. Thousands of Branford residents have donated their money, time and effort to accomplishing our mission. In addition, generous members of the Branford community have donated many of our properties expressly to preserve them in their undisturbed natural state, providing generations of Branford residents with places for recreation and enjoying natural beauty, as well as habitat for our local flora and fauna. The Branford Land Trust only takes positions on development projects where there is the potential to create conditions that could threaten these protected areas. We are very concerned about possible negative environmental effects of the proposed 44-acre retail development near Exit 56. The development will be upstream of 22 Land Trust properties including the 104-acre Van Wie Woods and the Van Wie Pond. Water drains from the proposed development area through culverts into sensitive coastal ecosystems that support local fishing, shellfishing and recreation. A major concern is that the large increase in pavement and other impervious surface will lead to changes in water quantity and quality, and have an adverse impact on these assets of our community. The proposed development could cover about 20 acres with new buildings and new pavement in a watershed that already has a very high amount of pavement (I-95 and the truck stop, Stop & Shop plaza and neighboring businesses between I-95 and Rt. 1). This new coverage will generate contaminated runoff (salts, other deicing chemicals, oil, grease and other pollutants) that, if uncontrolled, will be carried into the Van Wie Pond, wetland areas along Jarvis Creek and the Branford River, and ultimately the Long Island Sound. These additive impacts of additional impervious surface must be carefully considered. The scientific evidence clearly shows that even small increases in these pollutants can cause major changes in the functions of streams, ponds and wetlands. 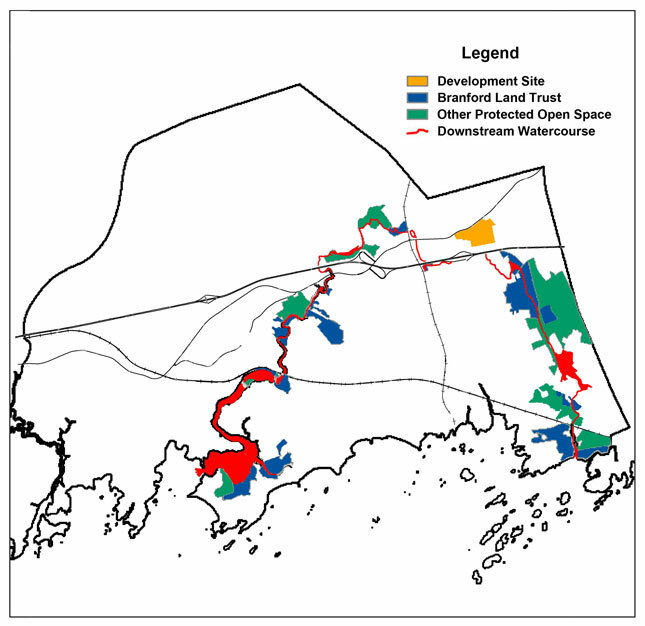 Unless the project incorporates (a) sufficient low-impact development features to achieve the necessary level of water quality, and (b) a well-designed management plan that is strictly implemented once the businesses are in operation, the properties that the Land Trust and the people of Branford have worked to protect will likely be damaged, probably irreparably. In order to fulfill our duty to protect the natural areas that we hold in trust for current and future generations, the Branford Land Trust will hire expert wetlands scientists and engineers to present the strongest argument for the need to reduce, as much as possible, the discharge of polluted stormwater into the wetlands, and the need to use the most effective stormwater treatment methods during and post-development. The Land Trust may also file as an intervenor in the Inland Wetlands and future zoning permit application proceedings in order to maximize our ability to protect the land that we hold in trust. We look forward to doing this as a collaborative effort with the developers’ team and other interested parties in our community, with the hope that they recognize our mission to protect the lands we hold in trust for the town, and will work with us to meet our concerns. 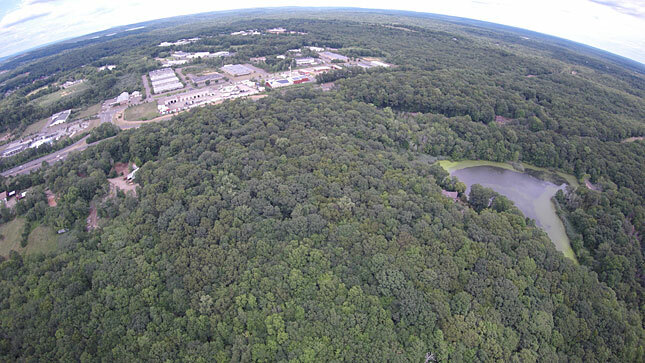 While some of our members may be in favor of Costco’s coming to Branford, and others opposed, the Branford Land Trust neither opposes nor supports Costco and the other proposed retail businesses. The Land Trust’s only objective is to protect the properties entrusted to us by the property donors and the thousands of people in Branford who have supported the Land Trust for almost 50 years. We do this in accordance with the principles and high standards required of Land Trust Alliance members. The Branford community and the Land Trust have made a large investment in the very special protected natural areas downstream of the proposed development site. If the upstream areas are to be developed, it is the Branford Land Trust’s responsibility to ensure that sufficient measures are taken to protect these natural habitats. Map showing development site in relation to BLT properties, protected open space and downstream watercourses.